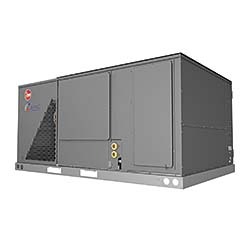 The H2AC™ rooftop unit features eSync™ integration technology to unite a facility's HVAC and water-heating systems to improve efficiency. The integration technology allows the unit to act as a water heater whenever cooling is required. The unit is designed to provide all air conditioning requirements while simultaneously pre-heating water up to 125 degrees. The unit is designed for placement on rooftops above kitchen spaces that produce large amounts of heat.